ePay from Office Center simplifies the gathering and recording of child and day care payments securely without the necessity of taking the time to make up Bank Deposit Slips and the necessary trips to the bank. Just think of ALL the time and effort that you will eliminate each week! The use of echecks from Office Center will help your business to grow by not draining your cash flow with expensive set-up or credit card fees that are due each month! 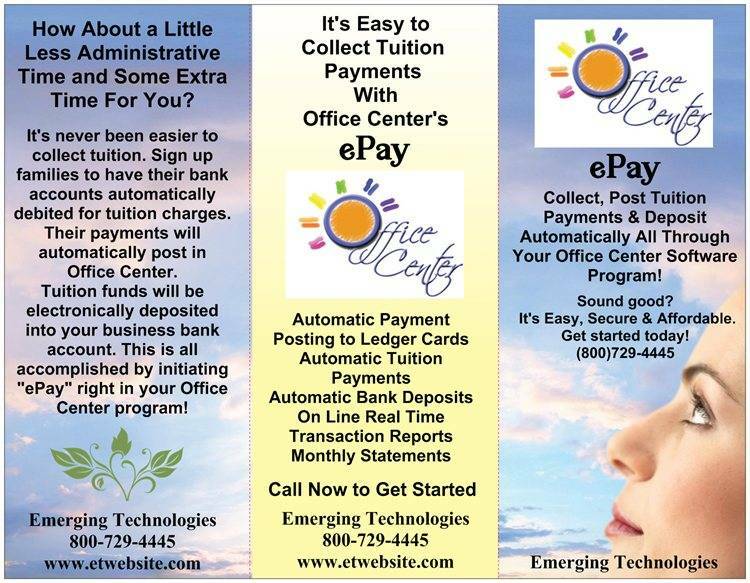 Because of the lower fees for echeck monthly transactions and the lower cost per each transaction, Office Center’s ePay services provide each and every child and day care provider or center with the ability to have a low risk Online payment option plan with very little investment and very little cost. NO expensive Credit Card Readers, No Printer Costs, No Waiting for Checks. ePay is just the latest enhancement to our existing eServices. To get started, just fill out the ePay Enrollment Form and email the completed form to michael@etwebsite.com. It takes approximately 5 working days to complete the approval process and recieved your online credentials for Office Center. If you would like more information on this ACH transaction feature, please fill in the information on the Demo Request page, or call us today at (800) 729-4445 for more information on ePay EFT/ACH payments.